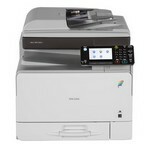 Ricoh has unveiled the Aficio MP301 and MPC305, two new A4 MFPs, monochrome and color respectively, which run at 30 pages per minute. These two new products have adjustable touch-screens (4.3 inch) and have fax as an option (SPF versions). The optional hard disk allows advanced features such as the document server (print and scan modes) and printing from a USB key (hard disk is required for this). Worth mentioning: there is no stapling feature available. These products reinforce the brand's mid-range A4 MFP offering.